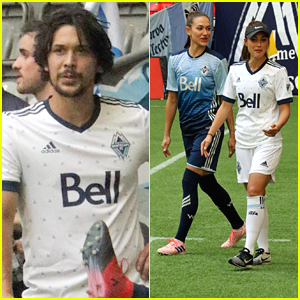 The 100′s Lindsey Morgan & Bob Morley Show Off Soccer Skills In Children’s Hospital Charity Soccer Match | Bob Morley, Henry Ian Cusick, Lindsey Morgan, richard harmon, Tasya Teles, The 100 | Just Jared Jr.
Lindsey Morgan and Tasya Teles head to the center pitch for the BC Children’s Hospital Benefit Soccer Match on Saturday (September 16) in Vancouver, Canada. The two 100 stars joined co-stars Bob Morley, Richard Harmon, and Henry Ian Cusick for the benefit match, which they played against Riverdale stars KJ Apa and Charles Melton. “Nobody told me we had training!!! God knows I need it! I’ll he there, come along and support!” Bob joked on Twitter before the game.